Want a fast and easy craft for Halloween that looks AMAZING? 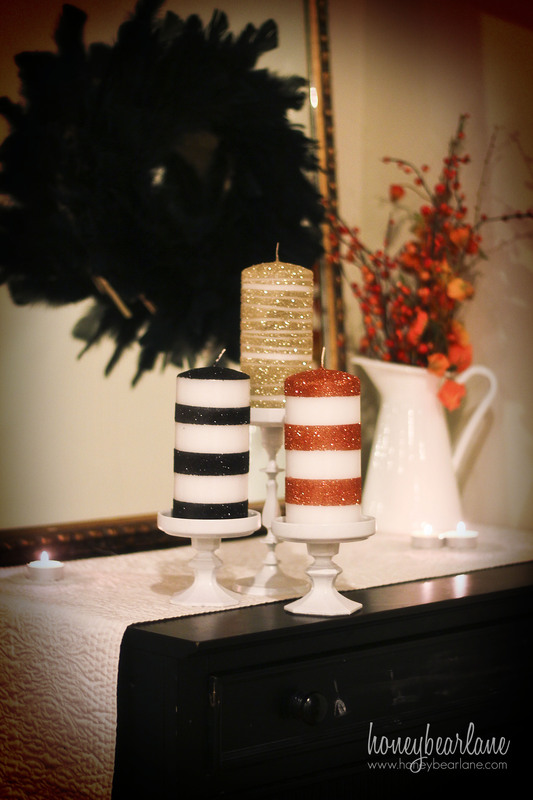 Try making these Glitter Striped candles! You can do so many designs with glitter but I was feeling lazy and so thought ‘why not just do stripes?’ I love how these turned out and they can be made for pretty much any holiday. Stripes are so modern and cool that you really can’t go wrong. Plus I LURVE them! So here’s how you make them! First buy some cheapo pillar candles. I got these at Hobby Lobby for 50% off but they probably have even cheaper ones at the Dollar store. Then get some glitter and spray adhesive and masking tape or rubber bands (or both.) Spray adhesive is super expensive, I had no idea! But once you have a can then you have it for a long time. I also bought the Martha Stewart brand glitter cause it’s awesome and so pretty. 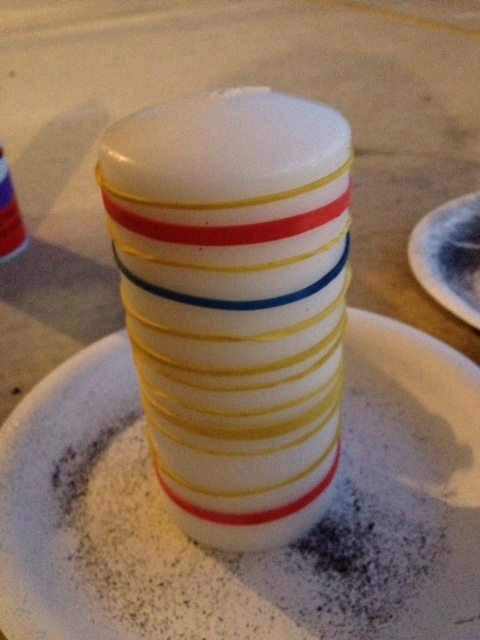 First you tape up your candles so they have stripes. 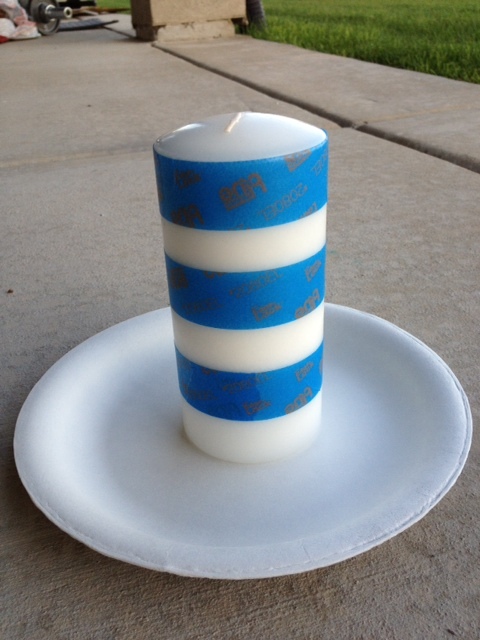 Here’s a great tip I learned AFTER I did the first candle–when taping make a little tab so it’s easy to pull off afterwards. Then spray the adhesive onto that bad boy. 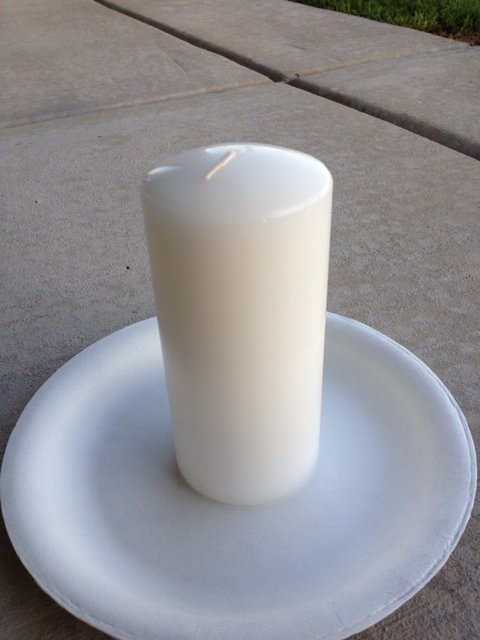 Then MOVE your candle to a different paper plate and sprinkle glitter on it. 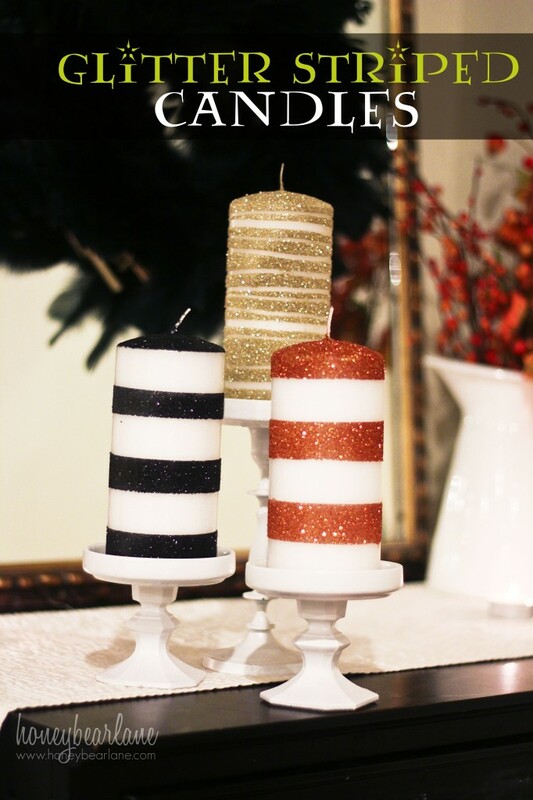 Use two plates to keep moving the candle back and forth, pouring the residual glitter from the plates. And you can even spray again if you need more coverage. I used about half a container of glitter on one candle. For the rubber bands, just slip on the rubber bands as you like and cut them off when you’re done. This method was a little harder but I liked the variation. The glitter looks awesome in the light of my house! Loving these, seriously. Super gorgeous. I like the one with the rubber bands. Did you seal the glitter afterwards one way or the other? Thanks for sharing! Hey! They look great! I have a question for ya though. Have you lit these yet? 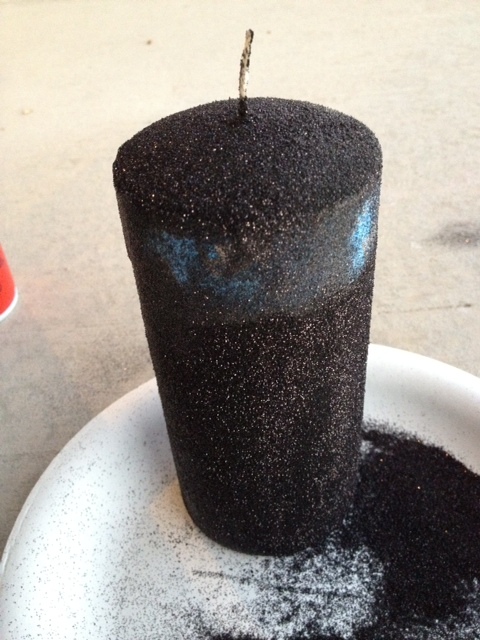 I just made some glitter taper candles for Halloween and they burn funny (like the glitter catches on fire!). It may also be because they burn all the way down while a pillar doesn’t. I also use mod podge instead (which was a major mistake! it was too hard to work with in this application), which could be another problem. They look pretty, I just can’t burn them. Any thoughts? I love what you did! I wish I had read this earlier and hadn’t made mistakes on mine! Sorry, I made these with the intention of being purely decorative, so I have not burned them. I’m sure the glitter causes them to burn weird though. 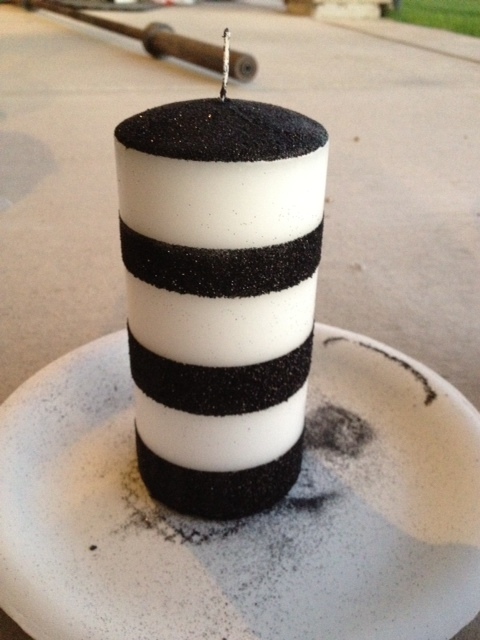 Your candles are so very pretty, thanks for the idea! 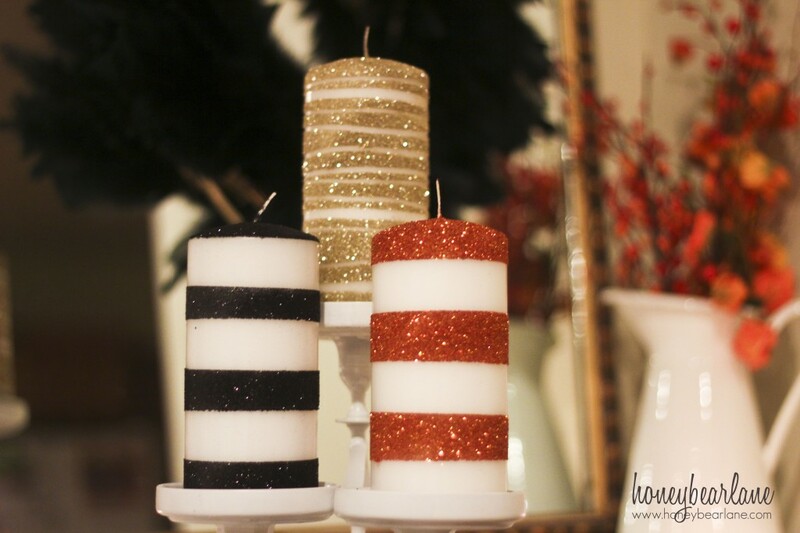 I have some blah looking candles kicking around and they need some sprucing up – and you can’t go wrong with glitter! I have your post here linked to my Halloween décor post too today, nice job! Wondering where you got your Candle Holders from? I like the size and color of them! 🙂 and also great DIY glitter Candle Idea! I actually made those too! I found some short candle stick holders and some coasters at the thrift store and epoxy’ed them together and spray painted after. Thanks!